Why Does My Toddler Go Potty at Day Care but Not at Home? It can be disconcerting when your child uses the potty at daycare but refuses to do so at home. Many parents and child care providers note this phenomenon. There are several factors that can make potty training a breeze at childcare (or for a provider) yet a hurricane at home. But you can use those factors to improve home potty training. When your toddler gets to her child care classroom or your nanny walks into your home, it's likely there's a stricter schedule in place immediately. In most toddler child care settings, there's an activity change every 15 to 30 minutes without much room for error. This means that while the bathroom door is always open, there are still scheduled potty breaks and diaper changes that take place throughout the day. Home Remedy: Talk to your provider about how they schedule potty breaks and start enforcing a similar schedule at home. Remember to hit those important times like after meals and before bedtime. Another thing that most caregivers learn in Toddler Behavior 101 is that you can get a toddler to comply a lot faster and more often if you phrase things properly. For example, if you say to a toddler, "We're going to take a potty break, OK?" That last "OK?" and the intonation of your voice indicates a request. Toddlers are pretty smart about this and even at the tender age of 2 or 3 can usually tell when they've got options. If, on the other hand, you say, "We're taking a potty break now. Ian, you're first. Make your way to the toilet," then you are a lot less likely to get resistance. Ian knows that you expect him to come to the bathroom and he doesn't have to put much thought into it. No decision needs to be made on his part. Home Remedy: Don't ask your toddler if she needs to go, just tell her it's time to try and voice it with confidence so she knows it's what you expect of her. At daycare, toddlers often have the example of a child who is already completely potty trained. Harnessing positive peer pressure, if Ian was already completely potty trained, he would be the first child chosen to go to the bathroom every day. He would be followed by several other regular pee-ers, and occasionally by those who had just started their potty training journey. Often times a brand new potty trainee may hang out in the bathroom just to get cozy with what his friends are doing. It may sound like an invasion of privacy, but going to the bathroom is sometimes a social activity, even for adult women. For toddlers, it helps make them feel less afraid and more confident about trying out this new activity. Home Remedy: Take your toddler to the bathroom with you. Make sure every member of the house does the same—brothers, sisters, fathers, and anyone else who is comfortable. The more she sees everyone else taking part in this very normal activity, the more she will want to take part as well. Your toddler has the schedule, the expectation. and the peer pressure in place. All these things are moving her toward being a skilled potty-goer. One last factor is the routine that goes along with going potty. Toddler teachers usually have this down pat and encourage toddlers to be as independent as possible. Pull your pants down, step up on the stool, sit on the potty, pull your pants back up, flush the toilet, wash your hands, go sit on your carpet square. Over and over, your child's caregiver will give these directions to your child. This routine is the same each time and comes to be something that your toddler relies on to guide her. It's a bit like practicing multiplication facts. The more you do it, the better you get. 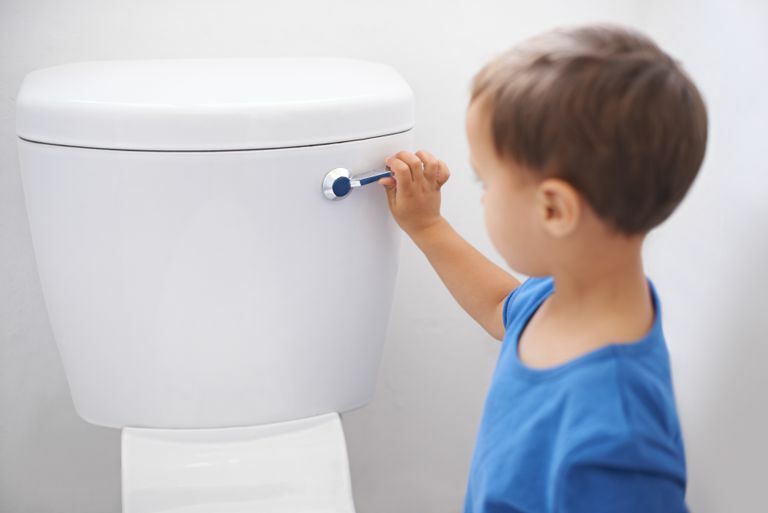 At home, there are usually fewer routines and every potty experience might be a bit different. You might be at a restaurant or the store or Aunt Michelle's. Daddy might give verbal instructions and Mom doesn't. Sometimes your toddler might be naked (like before a bath) and other times she might be wearing hard-to-manage pajamas. Pulling underwear up is different than dealing with disposable training pants. Those are a lot of variables for some toddlers and they are enough to throw them off track at home. Home Remedy: Keep your toddler's routine as consistent as possible, especially in the early stages of potty training when everything is new. Go through the same motions at home as you do away from home. For pointers, talk to your child's provider or hang out at school during a bathroom break to see what the routine is and implement the same routine at home. You are the provider of absolute and unconditional love. Your toddler trusts that no matter what she does, good or bad, at the end of the day you're still going to love her. Even under the best circumstances, she's not so sure she can place that same trust in a child care provider. This is not to say that she's afraid of her provider or that your provider is placing her under threat if she doesn't go potty. After staying on her toes all day for her child care provider, when she gets home, she can completely let loose. Home Remedy: There really isn't one. Just go with it and keep on loving your toddler even when she refuses to go potty for you or goes right on the floor. Give her a big hug, tell her, "I bet you'll make it next time," and hand her the paper towels.